Illustration of flowing water under the Antarctic ice sheet. Blue dots indicate lakes, lines show rivers. Marie Byrd Land is part of the bulging "elbow" leading to the Antarctic Peninsula, left center. A new NASA study adds evidence that a geothermal heat source called a mantle plume lies deep below Antarctica's Marie Byrd Land, explaining some of the melting that creates lakes and rivers under the ice sheet. Although the heat source isn’t a new or increasing threat to the West Antarctic ice sheet, it may help explain why the ice sheet collapsed rapidly in an earlier era of rapid climate change, and why it is so unstable today. Antarctica's bedrock is laced with rivers and lakes, the largest of which is the size of Lake Erie. Many lakes fill and drain rapidly, forcing the ice surface thousands of feet above them to rise and fall by as much as 20 feet (6 meters). The motion allows scientists to estimate where and how much water must exist at the base. Some 30 years ago, a scientist at the University of Colorado Denver suggested that heat from a mantle plume under Marie Byrd Land might explain regional volcanic activity and a topographic dome feature. Very recent seismic imaging has supported this concept. When Hélène Seroussi of NASA's Jet Propulsion Laboratory in Pasadena, California, first heard the idea, however, "I thought it was crazy," she said. "I didn't see how we could have that amount of heat and still have ice on top of it." To assure the model was realistic, the scientists drew on observations of changes in the altitude of the ice sheet surface made by NASA's IceSat satellite and airborne Operation IceBridge campaign. "These place a powerful constraint on allowable melt rates -- the very thing we wanted to predict," Ivins said. Since the location and size of the possible mantle plume were unknown, they tested a full range of what was physically possible for multiple parameters, producing dozens of different simulations. They found that the flux of energy from the mantle plume must be no more than 150 milliwatts per square meter. For comparison, in U.S. regions with no volcanic activity, the heat flux from Earth's mantle is 40 to 60 milliwatts. Under Yellowstone National Park -- a well-known geothermal hot spot -- the heat from below is about 200 milliwatts per square meter averaged over the entire park, though individual geothermal features such as geysers are much hotter. Seroussi and Ivins' simulations using a heat flow higher than 150 milliwatts per square meter showed too much melting to be compatible with the space-based data, except in one location: an area inland of the Ross Sea known for intense flows of water. This region required a heat flow of at least 150-180 milliwatts per square meter to agree with the observations. However, seismic imaging has shown that mantle heat in this region may reach the ice sheet through a rift, that is, a fracture in Earth's crust such as appears in Africa's Great Rift Valley. Mantle plumes are thought to be narrow streams of hot rock rising through Earth's mantle and spreading out like a mushroom cap under the crust. The buoyancy of the material, some of it molten, causes the crust to bulge upward. The theory of mantle plumes was proposed in the 1970s to explain geothermal activity that occurs far from the boundary of a tectonic plate, such as Hawaii and Yellowstone. 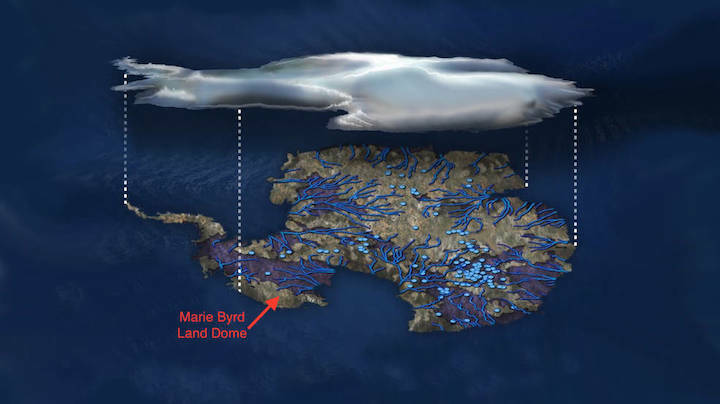 The Marie Byrd Land mantle plume formed 50 to 110 million years ago, long before the West Antarctic ice sheet came into existence. At the end of the last ice age around 11,000 years ago, the ice sheet went through a period of rapid, sustained ice loss when changes in global weather patterns and rising sea levels pushed warm water closer to the ice sheet -- just as is happening today. Seroussi and Ivins suggest the mantle plume could facilitate this kind of rapid loss. Their paper, "Influence of a West Antarctic mantle plume on ice sheet basal conditions," was published in the Journal of Geophysical Research: Solid Earth.